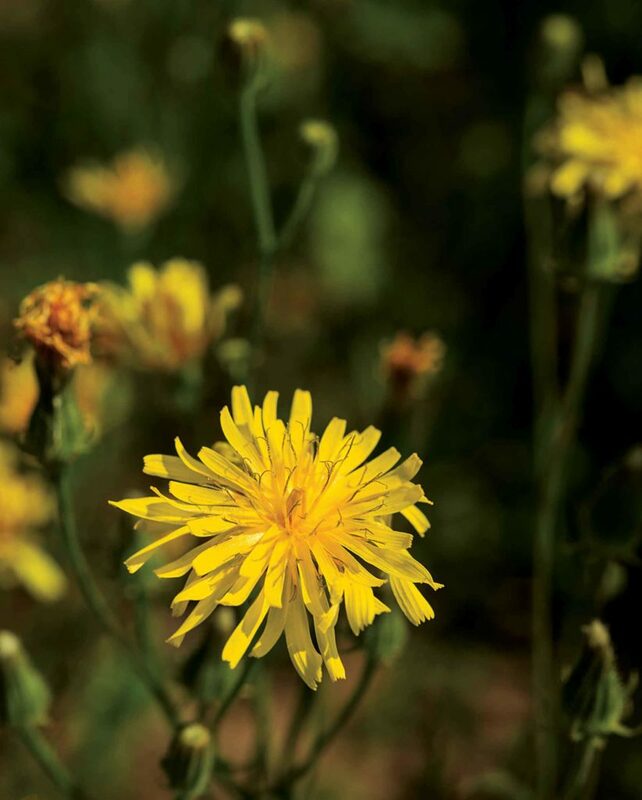 Narrowleaf hawksbeard, a potentially devastating new weed, is blowing into fields and rangeland from Canada. Seeing a new plant pop up in the field is exciting — as long as it’s not a surprise. Unfortunately for Brian Fuhrman, who farms wheat and pulse crops on the Montana Hi-Line near Opheim, it was the latter when he noticed an unexpected hint of yellow in his crops in 2009. Together with his local Extension agent, Shelley Mills, they identified the dandelion/sowthistle look-alike as narrowleaf hawksbeard. A winter annual that may have been introduced to the area through CRP alfalfa seed or simply moved south from Canada where infestations had already been reported, narrowleaf hawksbeard germinates in the fall, forms a rosette and goes dormant. It starts growing again in the spring before bolting to a height of 6 to 40 inches tall and producing seeds — up to 50,000 of them, reported to travel up to 15 miles on the wind. “It’s like a dandelion on steroids,” Fuhrman says. One of the major issues is it can germinate at almost any time. “It came out of Siberia originally and is very adapted to our climate. I’ve seen it germinate from April through October, any time the soil temperature is 41 degrees or more,” Mills says. It is not uncommon to find rosettes, bolted plants, and fully mature plants occupying the same space. Constant germination makes control of the new pest a challenge, especially in a region that has become known for producing pulse crops, which make broadleaf weed control of any kind difficult. The result is a rapidly spreading problem. Brian Fuhrman works with Valley County Extension agent, Shelley Mills, on control strategies. It seems fall control produces the best results so far. Mills recommends a post-harvest fall pass with glyphosate and a residual herbicide such as 2,4-D ahead of wheat. This should be followed up with a spring application of ghyphosate and a residual product as well as in-season control as needed. Protocol. She recommends a similar treatment protocol for pulse crops, minus the residual herbicides. “One farmer did two rounds of a fall treatment as a tank clean out, then sprayed glyphosate and Sharpen as a spring burndown before peas. The two rounds were the only part of the field not significantly infested. Fall treatment can be effective,” Mills says. At any given time a rosette, a bolted plant and a mature seed bearing plant can be found in the same square foot. 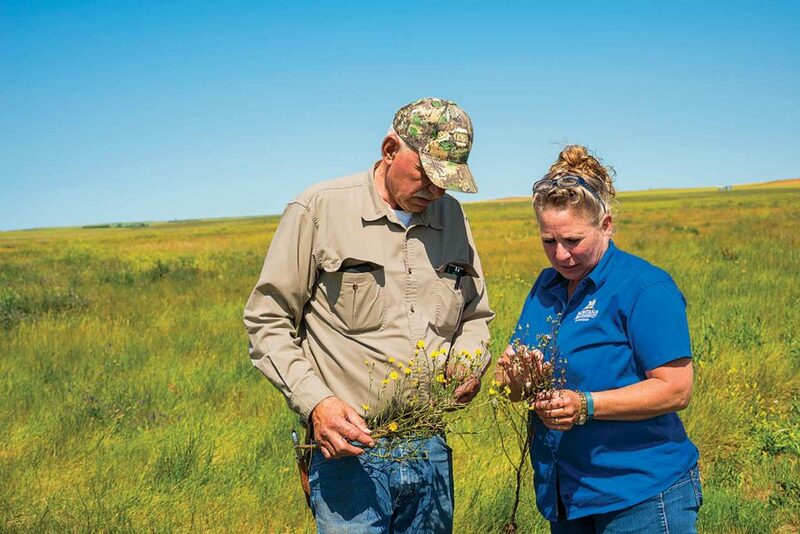 Mills and others are working on control strategies but encourage producers to scout and treat cropland aggressively to limit seed production protecting CRP and pastures. Food bank program helps both the hungry and growers.